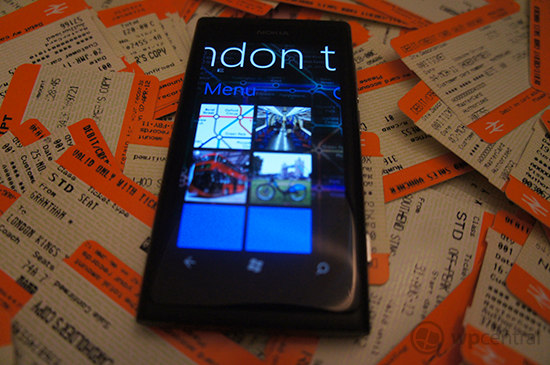 We've got a bonus Windows Phone Central Roundup for you today that focuses on travel apps, specifically London travel companions, for your Windows Phone. When traveling through London it can prove to be baffling when attempting to make use of public transport - particularly the Underground system. 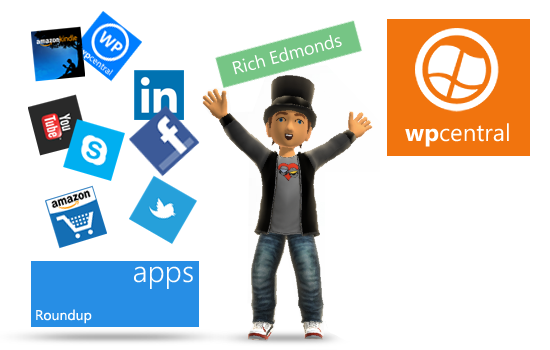 There are a number of apps available on the Marketplace that each offer unique functionality and user interface thanks to Windows Phone. But which one should you choose? If you're only aware of a single solution, Windows Phone Central has you covered with a number of apps available in the Windows Phone Store. Some free, others paid, and even Microsoft is involved. We'll mainly be looking at apps that sport useful functionality that cover not only the London Underground, but also Overground, London Bus and other public services. We've previously covered a couple of London travel apps in the past, as well as a quick comparison of two popular National Rail apps. Apps we include in this roundup may not appeal to every consumer, which is why it's good there's a strong choice. Each app sports a different structure, UI and feature list that will cater for different needs. So, without further delay, let's dive straight in. We've followed London Travel in the past multiple times, spanning from its release through the last update. The app is a popular, and highly rated Windows Phone app that sports functionality that makes it well worth the price tag. As the name suggests it helps the user travel across London, whether it be via the tube, on multiple buses or using both legs. The interface is simple and effective with tube status and Oyster readouts on the main screen for quick viewing. Individual routes can be selected for more information on any service alterations or disruptions that may occur and journey planning is included as standard. An offline tube map is available, as well as departure boards for each and every station. The Oyster account set in the settings can offer up more than one card should more than one be added to the user's TFL account. The chosen card can then be pinned to the home screen where live balance will refresh periodically. You can download London Travel for $0.99 (£0.79)and London Travel Lite from the Store. London Travel Live, much like it's name, is similar to London Travel above. 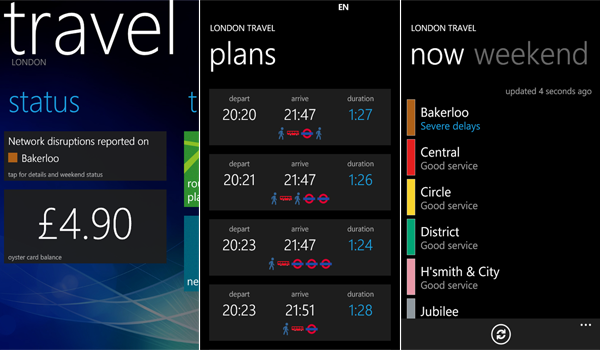 The app also sports live status readouts for all tube lines, a pinnable tube map, and a journey planner all in a unique and intuitive UI. 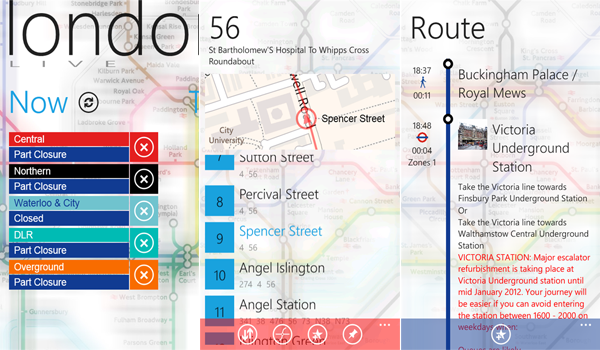 London Travel Live goes one step further with more functionality for London buses. Users can search for routes as well as individual stops to view where each stop is on the route, as well as which buses stop. If you're not into relying on public services that you don't control, London Travel Live includes support for the Barclays Cycle scheme. Users of the app can search stations, view available bikes / docks and see if it's a temporary station. It's a great way to stay in shape and this Windows Phone app is unique to support the scheme. But that's not all as the app comes packed with augmented reality, which is useful for those who are walking the street and need to find a nearby station quickly. Covered lines are also displayed so the incorrect station isn't approached. This is a welcomed feature for those who manage to calibrate the compass. You can download London Travel Live for $0.99 (£0.79) from the Store. Free trial is available. Bing Get Me There is an app developed by Microsoft for those who enjoy heading into London for the nightlife. Focusing on getting the user home, the app enables Windows Phone owners to input and set their home location that'll prove a blessing when attempting to use the smartphone while slightly intoxicated or out in the cold weather (which is generally highly probable on a daily basis in the UK). Favourites can be added, as is the case with other offerings, and lines and stations can be displayed with service reports. 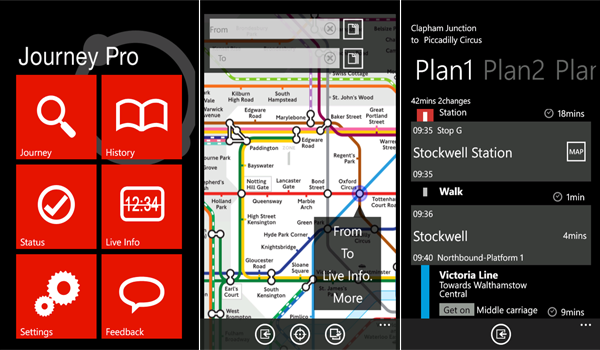 Offline tube map is also available with individual lines supported. London buses and the Barclays Cycle scheme are both not presently implemented for journey planning, station browsing or status reports. The home that's set in the settings can be pinned to the home screen for convenient access that will then show relevant travel information for getting to the configured destination with speed. You can download Bing Get Me There from the Store. Journey Pro is a full-featured app that sports a well presented UI and features the average consumer can put to use. 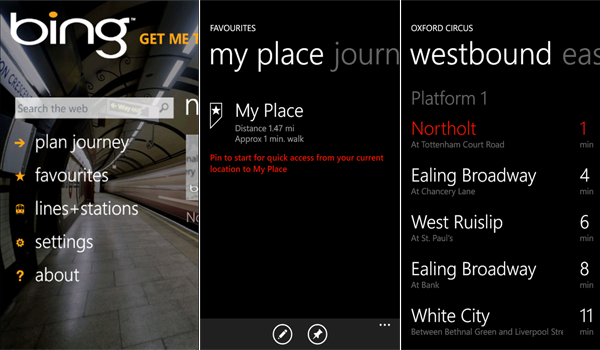 Also enabling users to set home stations, the app will attempt to plan journeys to and from the home station. The journey planning is intuitive with tube, National Rail and London buses. The user's history is easily reached for recent searches and convenient access to set favourites. Received plans can be viewed on the map and then selected to view more information. Users can also submit route suggestions should content not be available. The interactive map enables users to visually select desired stations as opposed to manually searching. You can download Journey Pro and Journey Pro Free from the Store. There you have our roundup of useful travel companions when heading to and through / around London. Each app above offers unique interfaces and functionality that will be better suited for certain needs. Whether you need an app to help you return home, allow you to visually search for stations, head into another reality, or even check out how many bikes are at a Barclays Cycle station, the collection we've provided will get the job done. Be sure to let us know your experiences in the comments as well as your own personal recommendations.